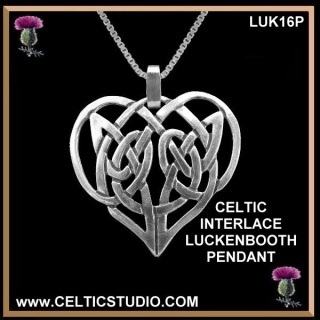 This is a stunning, modern style Luckenbooth design exquisitely designed in both sterling silver and pewter featuring a traditional Celtic interlace design. 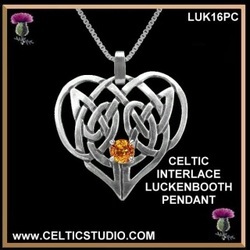 This beautiful luckenbooth is large in size, 1-1/8" wide (29mm) by 1-1/8 " (29mm). A perfect gift to a bride from her groom, to wear on her wedding day!! This beautiful sterling silver Luckenbooth is large in size, 1-1/8" wide (29mm) by 1-1/8" (29mm) and includes an 18" high quality chain. This beautiful sterling silver Luckenbooth is large in size, 1-1/8" wide (29mm) by 1-1/8" (29mm) and features a round amethyst. It includes an 18" high quality chain. This beautiful sterling silver Luckenbooth is large in size, 1-1/8" wide (29mm) by 1-1/8" (29mm) and features a round cairngorm (golden topaz). It includes an 18" high quality chain. 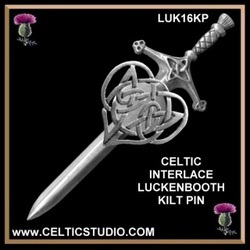 Our modern style Luckenbooth kilt pin is designed in high quality pewter featuring a traditional Celtic interlace design. This beautiful kilt pin measures 3-7/8” (99mm) by 1-5/16” (34mm) across the handle of the sword. Our modern style Luckenbooth kilt pin is designed in high quality sterling silver featuring a traditional Celtic interlace design. This beautiful kilt pin measures 3-7/8” (99mm) by 1-5/16” (34mm) across the handle of the sword.